Perennials, Annuals & Veggies: Tips, Tricks & Pix cubit: Myth #1: Perennials Never Need To Be Replaced. Myth #1: Perennials Never Need To Be Replaced. There are several popular myths associated with perennial plants. One is that once purchased and planted all perennials will never have to be replaced. They will live for not just more than two years (more than a biennial), but actually for years and years. A second myth is that all perennials require little or no maintenance. Maintenance aside, some perennial species/cultivars just live longer than others. Some perennials are invasive, though often just in some particular growing environments. Invasiveness could be taken to indicate longevity in perennial gardens. Nevertheless, perennial gardeners usually avoid invasives because they prefer diversity (both in their gardens and in the natural environment). In nature, short-lived plants compensate for their short lives by reseeding themselves, often copiously. In the garden, short-lived perennials like blanket flower, columbine, musk mallow, rose campion and tickseed do the same, particularly those forms of these plants which are u nchanged, or little changed, from their ancestors which grow in the wild. 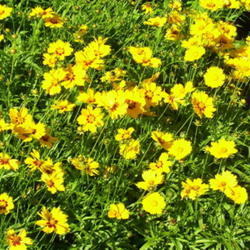 The picture shows tickseed, Coreopsis lanceolata 'Sterntaler'. Strong seeders do not need to be replaced by gardeners. They replace themselves. Depending on the growing conditions and the personal preferences of individual gardeners, some of these big seeders can be viewed as invasive. In fact, dealing with them can be more difficult than dealing with seeding weeds. Seeding weeds can be eliminated before they flower. Perhaps the most desirable property of perennials is that they be clump-forming. Breeding perennials has produced clump-forming varieties from running wild ancestors. Breeding also produces other things like showier flowers, new flower colours, smaller and shorter plants and resistance to diseases. Many of the plants that result are sterile and so when these plants die gardeners have two choices; pay the money to replace them or stop using them. Among short-lived non-seeding perennials I have used are delphiniums, lupines, painted daisies, pincushion flower and shasta daisies. At least in the growing conditions of my gardens, they tend to survive only two, three or four years after purchase and planting. The odd individual plant may survive longer, but perennial gardeners may decide not to use such plants. With particularly attractive perennials, like the not very hardy Pacific Hybrid delphiniums which are very available here, gardeners may choose to carry on replacing them anyway. Climate and soil conditions aside, many perennials are recommended on-line as "long-lived". The following is based on three perennial gardens which I maintain and have done so for 10 or more years. I would expect the following, planted in appropriate locations and with adequate maintenance, to normally last for at least 5 to 10 years. The following includes only perennials I have used and still do: certain (hardy) species/hybrids/cultivars of astilbe, aster, balloon flower, barrenwort, betony, bugloss, catmint, chrysanthemum, culver's root, false sunflower, fleeceflower, geranium, globe flower, globe thistle, hosta, iris, lady's mantle, leopard's bane, lungbane, masterwort, meadow rue, monkshood, oriental poppy, peony, phlox, red valerian, sea holly, salvia, Solomon's seal, southern lupin, turtlehead and yarrow. The same goes for Crocosmia 'Lucifer', Penstemon digitalis 'Husker Red', Rudbeckia fulgida 'Goldsturm' and Veronica umbrosa 'Georgia Blue'. 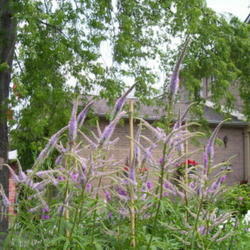 The picture shows culver's root, Veronicastrum virginicum 'Fascination'. Daylilies are well known as long-lived perennials. I am very pleased to have started using them four years ago, when the lily beetles finally turned me away from true lilies and toad lilies. As David Tomlinson of Merlin's Hollow, Aurora, Ontario, Canada says, one secure way to have long-lived perennials is to obtain established forms which have proven their worth over time, sometimes over generations. One source of these is local horticultural society sales, though the purchaser does need to know enough to avoid buying the invasives which may also be offered. Some of my best phlox and my best globe thistle came from such sales. An example of David's Use-Proven-Forms approach is purple coneflowers. New forms come on the market each year. Although some of the newer forms do appear to last, older forms such as 'Magnus' and 'White Swan' typically live on, while my experience is that many newer ones do not. The prospective life expectancy of particular perennials may not be something we have in mind when we buy perennials. However, maybe in the interests of personal economics, we should think about how long we can reasonably expect our potential purchases to last. I've owned a small local perennial gardening business in Aurora, Ontario, Canada for about 15 years. Life became a bit less hectic when I retired from teaching (Chemistry) three years ago. I'd call the type of gardening I do Extreme Perennial Gardening; that is using only perennials to get continuous and changing bloom colour through spring, summer and fall. I'd say Extreme because getting colour change through one year may not be easy, but getting it to continue over years is definitely a challenge.